Die cut letters will help you to make your cards truly personal to your recipient? You could add someones name, or a special greeting to suit the occasion. Your friends would be delighted with the same treatment no matter how unusual their name is. The greeting could be anything you wanted and this lovely card has the need for something extra. 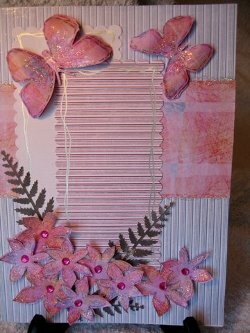 The papers are from Making Handmade Cards and they are really pretty but they need to be set off to enhance them. The butterflies and the flowers have been sparkled up, and the gemstones add interest to the flower centres but it lacks that certain something. 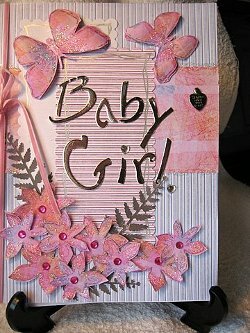 Look at the difference the die cut letters, in silver mirror board, have made to this baby card. And a simple length of pink velvet ribbon along the spine add the finishing touch. The little silver tag alongside the words says "Handmade with love" and is just a simple charm that has been added to the card. 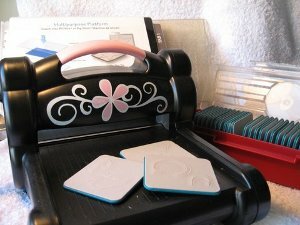 The alphabet I have used is the "Azure" set from Sizzix and you will need a Die Cutting Machine to use them. Not cheap pieces of equipment, but for that extra touch they were worth it for me. You can buy alphabets from many companies these days ... Crafters Companion, Spellbinders and many others, in many different types of fonts and sizes. So shop around for the bargain buy, and add them to your cards for that special touch. Always remember to add "Handmade by....your name..." to the back of the card.